It’s a great way to promote tourism while having lots of fun! This second running of the event took place as part of Tourism Awareness Month, sponsored by the DHTA (website). 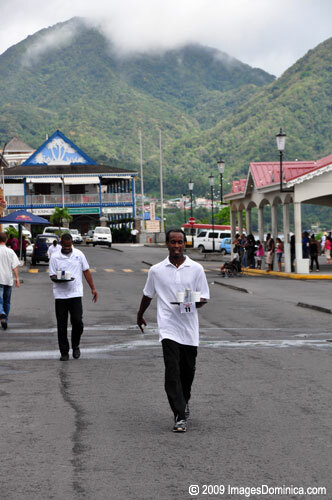 Saturday afternoon on the bayfront in Roseau, waiters from restaurants across the island gathered in the light drizzle to ‘fast-walk’ their way to great prizes. After making two complete circuits from the Museum to the Market carrying trays of filled cups, participants had the contents of their tray measured. It wasn’t speed alone that augered success – accurate handling of the tray was essential as each gram of missing liquid resulted in a time penalty. Congratulations to all the winners & participants in the 2009 Waiter’s Race and to sponsor Red Bull! And put the 3rd Annual Waiter’s Race on your calendar for May, 2010.